Would you like to take a look inside my private journal and see one of the most profoundly impactful entries I ever wrote? That's exactly what you'll find here. As I mentioned in a recent blog post, my hope is that it will help you when I share examples like this. For one, it's an opportunity to (re)learn life lessons along with me as I name them for myself in my journal. Journaling has been so huge for me. It's the tool / practice that has had the biggest impact in my personal, professional, and spiritual development. So I want to help YOU learn how to use it this way too. And I think examples help. To get the most out of this example, though, don't just stop here. 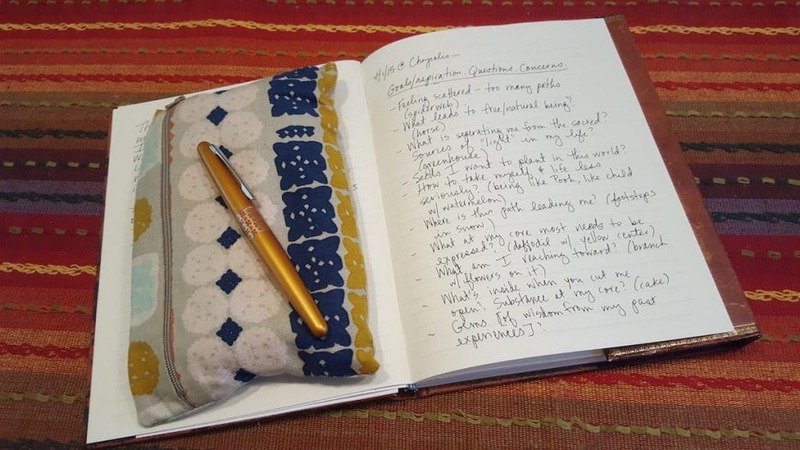 Be sure to head over to my In-Depth Guide to Using Journaling For Personal Transformation. You'll find everything you need there to turn journaling into a tool that YOU can use to change your life. The theme for this particular session was "A Spiritual Check-Up." It was playfully modeled on a visit to the doctor — except here our *spiritual* health was under examination, and we "met" with a spiritual guide on the pages of our journals. 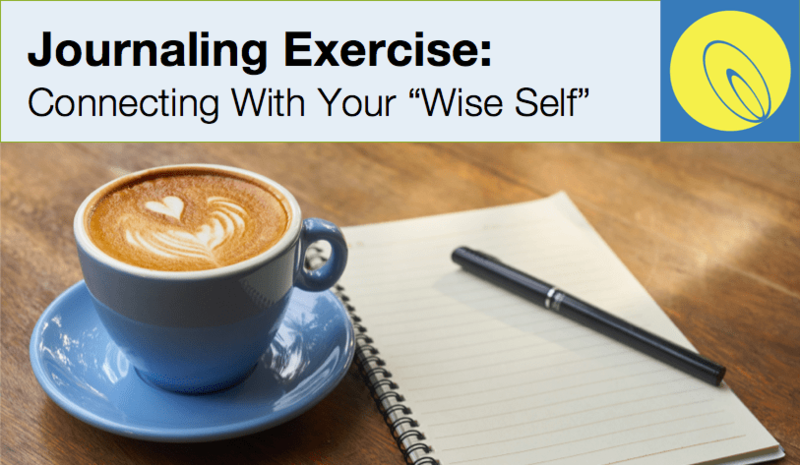 This journaling experience was an opportunity to investigate the state of our spiritual lives — and to leverage our inner wisdom to take it to the next level. As we began, we formed an intention to set aside judgment and instead approach the experience from a place of peace, openness, and receptiveness. Each person around the circle shares a word or phrase that describes her/his state of being in that moment. In a sense, this check-in is a centering exercise. It's an opportunity to stop rushing about and to reconnect with ourselves — often for the first time in hours. The check-in was followed (as it always is) by a formal "centering" exercise. 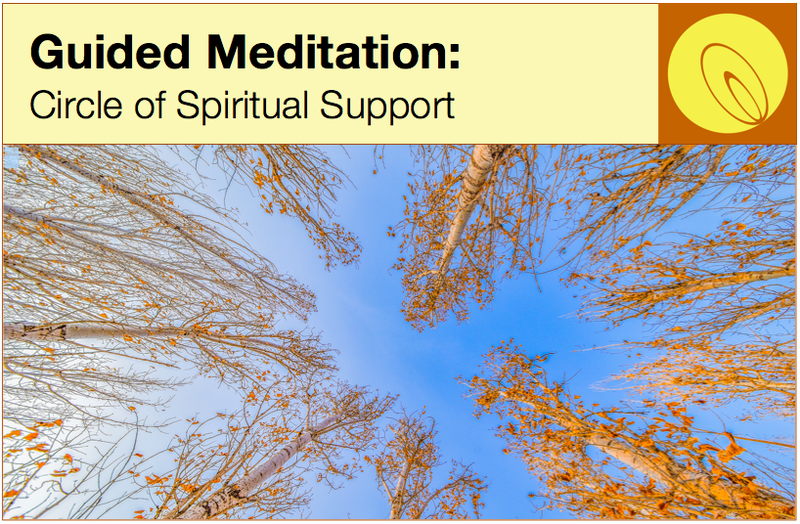 In this case, it was a guided imagery meditation about the experience of feeling spiritually supported. At the end of the meditation, each person chose a spiritual guide (real or imaginary) to "meet with" in their journal. when you become an email subscriber. Get this mp3 recording PLUS new posts, free resources, weekly journaling prompts, insider discounts, and more. For the 10-minute warm-up write, we made a list of things we wanted to discuss with the spiritual guide we would "meet with" in our journals. Continuing with the doctor's visit theme, we had the option of flipping through a "waiting room" magazine and using the pictures to trigger ideas about what we might want to discuss with our guide. The words in parentheses are the images I spotted that prompted me to add that particular question or issue to my list. It's an interesting experience for me, reading back through this list. Each question is really a kind of shorthand for existential themes that have been present in my life for decades. While the language I use may change, these same basic themes come up in my journaling again and again — and I'm sure will continue to do so. Reflecting on them now, though — a few years after writing the list — I'm struck by how far I've come in living out my answers to the questions. Below is the 20-minute write that followed the above warm-up. Here, we wrote in the voice of the spiritual guide we had selected — providing sage advice in response to the questions and issues on our list. Since I was leading the guided imagery and couldn't fully participate in that experience to select my guide, I had defaulted to my old standby — inviting a much older, wiser version of myself to join me on the pages of my journal. Elaine, my child, you have glimpses often of what your life could be, but then you run after the wrong things. Think about your experiences of last night — I was there, watching. Remember the promise of contemplating two months of nightly ritual and reflection around the practice of counting the Omer? Remember, still more powerful, the actual experience of reading M.F.K. Fisher’s profound words about beauty in life’s mundane experiences? Remember being so moved by her remarks about what is unsaid hanging there on the page, saying worlds about who you are and what matters to you? You know from your own past experience that it is in truly slowing down to observe the wonder of each experience that you connect most profoundly to That Which Is Eternal. The wonder comes in the form of simple beauty, in the mere vibrating resonance of “now”, in deep connection with and compassion for others. It is the mindful now-ness that reveals what was always there and that you have been yearning for. The process stuff you get obsessed with, the career goals you work relentlessly toward, the expectations you compulsively try to meet — these things are distractions. It’s not that you shouldn’t do them, but that your attention shouldn’t rest on them but instead on what is beneath them, beyond them, behind them. To use M.F.K. Fisher's metaphor, they are letters on a page, simple shapes. Don’t get wrapped up in the shapes. Look beyond them to the message, the meaning and — as she suggested — to what cannot be written. You discounted the Chrysalis Spiritual Paths program as one more obligation — a time sink you can’t afford. But what are you investing in? Not the things that connect you to The Inexpressible. Not regularly. And that’s where you should invest. "What are you investing in?" It's a question we should all ask ourselves from time to time. The impact of asking myself that question on that evening turned out to be huge. I'll share a bit about that below. After doing the above "deep-dive" write, we each spent a few minutes reading silently over what we had written. And then — as we always do at these monthly journaling sessions — we passed a "talking stick" around the circle, so those who wanted to could speak a bit about their journaling experience or insights. On a small slip of paper, we each wrote out a "prescription" for ourselves for enhancing our spiritual health. It's funny. When I look at the words that I wrote in my journal that night, they're just a faint echo of the profound experience I was having. But in a way, this journal entry changed my life. That final question — "What are you investing in?" — it stuck with me for a long time. It was constantly going through my head, impacting me as I made little every day choices. I started being a lot more intentional about where I was investing my time, energy, attention, and even my money. Not just in a spiritual sense, even though that was the focus of this journaling experience. I also saw changes in other areas of my life — such as work, self-care, and relationships. And in the same way that financial investments can multiply over time, so did my investments of time, energy, and attention. I'm still benefitting tremendously from the choices I made 3 years ago as a result of writing this entry. Was this journaling experience a lightening flash that came out of nowhere? No. Some subtle shifts were already starting to occur because of other small things I was doing. (See my guide to transformational journaling for information about how to set yourself up for success in this way). But this write was an accelerator that took those little sparks and turned them into a gorgeous and powerful bonfire. Did it fix all my problems in life once and for all? That would sure be nice! But... Nope again. I'm still human and fallible. I still make unwise choices from time to time. I still can't control everything that happens to me. I still need to practice on a regular basis if I hope to keep myself aligned with (and investing in) what matters most. My life is so different now than it was then — more authentic, meaningful, and full of promise. And I can trace it all back to what this journal entry kicked off for me. Want to recreate this experience for yourself? I've assembled everything you need right here! Then, use the numbered instructions and prompts below to guide you through the steps in this process. when you become an email subscriber. Get this guided imagery mp3 PLUS new posts, free resources, weekly journaling prompts, insider discounts, and more. 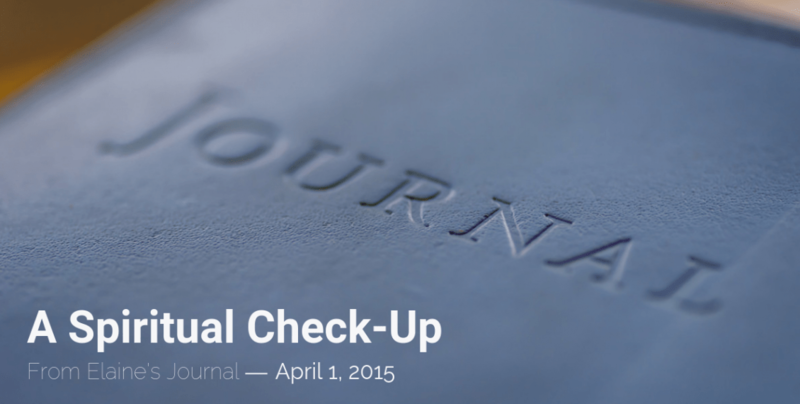 Prepare Your Journal: Open to a fresh page in your journal. Put today's date at the top, along with the title "Spiritual Check-Up". Check In With Yourself: Take a couple slow, centering breaths. And then tune in to yourself. Notice how you're feeling in this moment. Write down 1-3 words or phrases that describe what you're noticing as you make contact with your whole self — mind and body, heart and soul. Set Your Intention: How do you want to approach this writing experience? What will you give your attention to? My intention when I wrote the above was to investigate the quality of my spiritual life, to contemplate opportunities to deepen it further, and to do all this with openness and curiosity rather than judging myself and my life. Take a moment now to consider the wisest way for YOU to orient toward this experience. Center Yourself: Use the above guided imagery (or your own meditation) to still yourself, cultivate a feeling of being spiritually supported, and to select a real or imaginary spiritual guide to "meet with" through your writing. Do Your Deep-Dive: Set a timer for 20 minutes, and begin writing in the voice of the spiritual guide you selected. Imagine that they've seen your warm-up list, and allow your pen to record their wise response. Don't over-think this. Keep your pen moving, and let go of any concerns about correct grammar, spelling, logic, etc. If you need to interrupt from time to time in your own voice to pose a question to your guide, that's just fine. Stop writing when the timer goes off. Read & Reflect: Read back over what you've written — from your check-in words/phrases all the way through your deep-dive write. Then add a few final sentences or bullet points in response, starting with the words, "What's standing out for me is..."
Write Your Prescription: Take another 2-3 minutes to close your eyes, take some centering breaths, and relax your body. Then ask yourself, "What would be the wisest possible prescription for enhancing my spiritual health?" Write your prescription for yourself at the bottom of your entry. (Or if it works better for you, let your guide again be the one to write.) If you want to get fancy, draw a box around it and turn it into an official looking prescription slip by signing and dating it! I hope you have a lovely time with this, dear one! If you try it out, let me know how it goes! You can share your experience on social media (click the icons). Or drop me a line via my contact page if you'd like to email me privately.